The EI RIF will also prevent the danger of explosions during uncontrolled discharge operations. The piece of equipment is supplied in the specified dimensions according to customer requirements. Problem-free integration with existing pipe or hose conveying systems goes without saying. a very easily scanned analog display monitors the operational readiness. 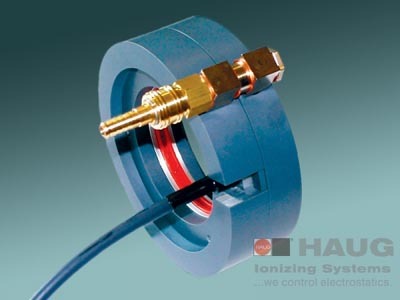 It is absolutely essential that ring ionizers are used in the plastic and automobile industries, on injection moulding machines and extruders as well as on metal separators. Its full capability is displayed in the transportation, conveying and feeding of granular and powdery materials, especially of plastic granules and mixtures.